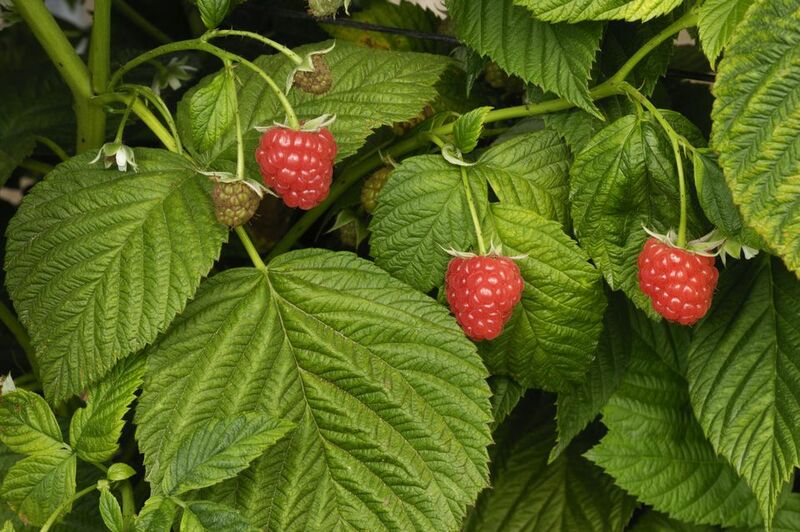 Raspberries are fairly care-free plants to grow in your garden. For most of us, the main challenges of growing these brambles are keeping them under control (some varieties spread like crazy!) and protecting our berry harvest from birds and other animals. But if you notice that the tips of some of the branches have died back or look wilted, or the foliage is turning red well before fall and entire canes are wilting, you very likely have a borer problem. The three most common raspberry insect pests are raspberry cane borers, red-necked cane borers, and raspberry crown borers. If you're seeing just the tips of some of your raspberry canes wilting, you're dealing with the raspberry cane borer. Raspberry cane borer is a small (1/2-inch), black long-horned beetle. It has yellow stripes on its wing covers and a yellow thorax with two black dots on it. The female beetles create a double row of holes a few inches below the leaf tips in spring, and they lay their eggs in those holes. In late spring to early summer, the larvae hatch and start burrowing their way down to the roots, where they will overwinter and start the whole cycle again the following spring. In the first year, you'll see the wilting cane tips from the punctures the adults made as well as the damage the borer is causing as it makes its way down the cane. The following year, if the borer has made its way all the way to the roots, the cane will likely die back. To get rid of raspberry cane borers, keep an eye out for wilted tips. Once you see them, prune back any wilted tips, cutting the cane 6 inches below where the wilting stops. Likely, the section you've removed contains the troublesome larvae as well. Destroy (don't compost!) any tips you've pruned out. Keep an eye out the following spring for any additional wilting tips, and prune them out as well. If you're noticing random swollen areas along the canes of your raspberry plants, you're dealing with red-necked borers. The red-necked borer is a bluish-black wood-boring beetle. The coppery-red area just behind its head gives this pest its name. Adult females lay their eggs in the bark of raspberry canes in late May through early June. Upon hatching, the whitish larvae bore their way deeper into the cane, where they overwinter. This causes the branch to swell about a half inch or so in diameter, and for a few inches along the length of the cane. The cane might die or just break off at this weakened, swollen point. To get rid of red-necked borers, cut out and destroy any canes with signs of swelling during fall and winter. Don't compost the canes; throw them in the trash instead. If the leaves on your raspberry bushes are turning red prematurely, or entire canes are wilting, you're dealing with raspberry crown borers. The adult raspberry crown borer, which is a clear-winged moth that resembles a black and yellow wasp, lays its eggs on the underside of raspberry leaves in late summer. In early fall, the eggs hatch, and the larvae make their way to the soil, where they begin to feed on the roots. The pupate in the crown of the plants hatch the following spring. To get rid of raspberry crown borers, remove affected canes at the crown and destroy them. However, if upon inspection you see that the whitish larvae are already in the crown, the only thing you can do is dig up and destroy (don't compost) your plants. We hope these tips help you identify your raspberry pests. Regular observation of your plants is the best prevention against these pests causing too much damage.